I’ve written before about the benefits of being a Priority Pass member. Priority pass is a stand alone membership that allows you to access hundreds of airport lounges worldwide. Most of these lounges are contract lounges, not necessarily affiliated with a particular airline. They’re particularly useful when traveling in parts of the world that don’t have a major airport alliance lounge, or where you’re off-brand with your ticketing and don’t have access based on status or club membership. We have some notable places where Priority Pass lounges give us great coverage- Mexico, parts of Europe, etc. They also now allow you to bring up to two guests in with you without charge, which really is a huge benefit. I might be dubious that this program is the right fit for the average US flyer who has other options since it’s a significant membership fee ($400) annually. However, American Express Platinum members get a Priority Pass card free!! This is yet another reason to keep the Platinum card around. Between Priority Pass and Centurion lounges, you could arguably ditch regular lounge membership altogether. Now, in addition to this, Priority Pass is adding a new benefit- free meals at select airport restaurants. The list is short, but growing. Originally, Denver and Portland were some of the early recipients, but now there are three options at LAX as well. How it works is extremely simple- presenting your priority pass card entities you to a set amount off the check- usually around US $28. This can be applied toward anything on the bill, including tax, but you’ll need to leave tip separately. In addition, if you have a guest with you, you can double that amount. Plus, multiple card members can use their allotment towards the same check, since it operates as a voucher. So, a family of 4 with two card holders could run up a check to $112 before actually having to pay anything aside from the tip! 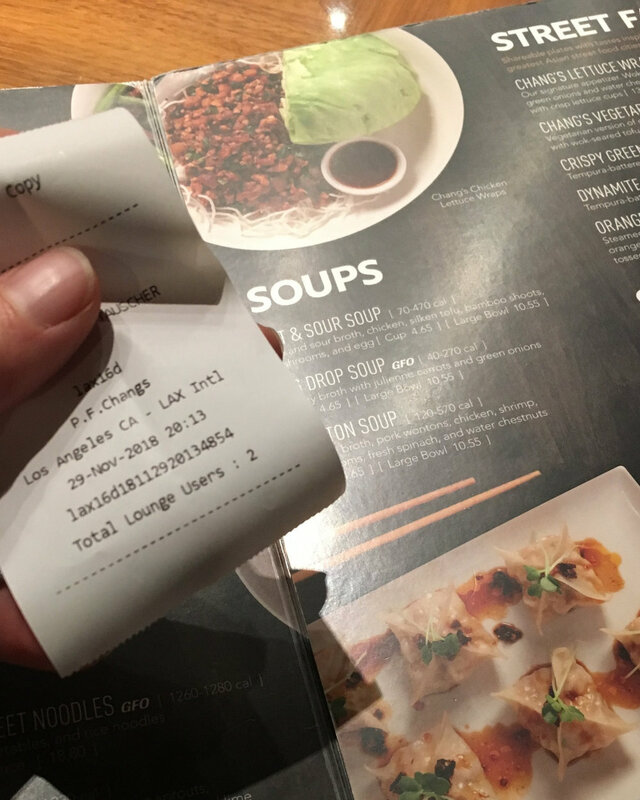 Recently, LAX has added PF Changs at TBIT to the program, and the restaurant gives a full $30 voucher, instead of the regular $28. If you’re alone, $30 is about right for a drink, soup, and entree. They open at 11am, and have table and bar seating. I’ve made use of it several times, and never had any issues. Plus, with TBIT now connected to terminals 4-8 air side, plenty of people can easily use this benefit. What does travel that’s entirely about the journey and nothing else look like? What would you plan if the entire purpose, the entire goal, was to experience the best that airlines, airports, and hotels have to offer all while laying out the minimum of value, and earning plenty of benefits in return? Well, if you’re willing to take my advice on the matter, I’ll be happy to tell you. In a little over a week, I’m headed out with a friend or two for a whirlwind literal ‘trip around the world.’ I’ve done a similar flightpath before, and I’m excited to be able to do it again. This is a case where you anticipate the repetition, and aren’t the least bit tired of it. It’s an intricate set of flights, months in the making, that tracks around the globe, moving ever westward until I return back to my home airport of Los Angeles. It’s a run through 6 flights, on five separate itineraries, three Oneworld airlines, and six airports. It takes roughly four days, and only requires one night in a hotel. In the end, it earns roughly 30,000 qualifying miles with American Airlines, and will finish out my Executive Platinum status for the qualifying year. By my calculations, I’ll cross the 100,000th mile someplace over the ocean northwest of Belfast, and South of Reykjavik, depending on the day’s flightplan. The story of this trip begins months ago when Qatar Airways had essentially a two-for-one sale on already discounted business class tickets from Colombo, Sri Lanka, to Philadelphia. This seems like an impossible routing when you’re starting in Los Angeles, but with this particular hobby, this is just par for the course. Since it was two for one, I was lucky to have a friend who was willing and able to go along. We picked up this part of the trip, and then set about finding the rest of the needed flights. As it happens, a month or so later, American discounted (and continues to discount) their premium economy fares between the US west coast and many Asian destinations. This deal works for round trips, or as was needed here, one way tickets. I applied a further discount using the airline credit on my Amex Platinum card, and booked a ticket that got me as far as Hong Kong. Soon after, while cruising around Expert Flyer and British Airways’ website, I caught sight of a partner award ticket on Malaysian Airways from Hong Kong to Kuala Lumpur in business class on their lie-flat a333 product. Some Membership Rewards points and a few dollars in taxes later, and I had my ticket to Malaysia. Now I was getting closer. I’d been watching fares for the economy tickets between Kuala Lumpur and Colombo like a hawk, trying to decide whether to buy one or cash in a few more MR points, when the exact flight I needed dropped their business class tickets to economy prices for about 48 hours. Some fast thinking and wading through MYR to USD conversions later, and I was almost done! Now, all that was left was to get home from Philly to LAX. Early on I managed to find a milesaaver first class ticket through Chicago, and booked it with my AA miles. It wasn’t all that many miles, but I’m running low after taking everyone around Europe this summer, and the ticket got me home at 11pm after a long weekend of flying. So, I had an option, but I kept an eye out. A few months later, I realized I had some more AA cash to spend through Amex, and there was a cheap one way fare on AA’s a332 widebody where I could pick a Premium Economy seat for no extra charge. Plus, it would get me home hours ahead of my mileage ticket. Sold! I cancelled my award ticket after booking for free, which is one of the best benefits of being Executive Platinum. Complimentary brunch at the KL Sentral Le Meridien. First course. This trip is a redux of my first experience on Qatar Airways last year, which was a wonderful experience in many ways. Though many things are similar, there are still some new experiences that I’m excited to have and review. It will be my first time flying Malaysia Air’s business class, and I’ll be doing it twice- once on their a333, and once on a 737. I’ll also have some more flights in AA’s Premium economy, unless the upgrades clear, of course. I have flown this product on some short flights domestically, and once to LHR, but haven’t done an trans-pacific route. After spending some time on long haul World Traveller Plus on BA, it will be a good comparison refresher. Last, but certainly not least, while keeping an eye on my flight on Expert Flyer, I recently noticed that our flight from Colombo to Doha has had a seat map change that indicates that they’re flying a 777-300 that’s been upgraded to their new “Q-Suites” business class product! I’ve been hearing great things, and can’t wait to see it for myself. We’ll only have this one flight to experience Q-Suites, since our connecting flight to Philadelphia is on their regular a350 cabin. However, that is nothing to complain about, as it only came into service a few years ago. Combined with Qatar’s stellar onboard service, there’s really not a bad option in their fleet. Plus, this is the airline that’s currently offering free nights at the Ritz Carlton Doha if you happen to have a long layover. We don’t on this trip, but I’ve enjoyed their hospitality before. The planning done, I’m counting down the last days until departure. The flights aside, I’m also looking forward to traveling with friends I haven’t seen in months, and who I generally only see in airports since we live in different cities. We’re working out what to do on the layovers, what highlights to see in Hong Kong and Kuala Lumpur, as well as what airport lounges are worth an extended stop. However, what happens between jetbridges is subject to change when unexpected adventures present themselves, as they always do. When the only goal is the journey, this is doubly so. I can’t wait to find out what this one has in store. The entry to the Business Class lounge at Doha Hammad Airport. There is no better way to finish three weekends of mileage running to Copenhagen in Premium Economy and Economy than to ditch out on the last long haul in the back of the bus, cash in some Avios and American miles, and head to Doha to catch one of the longest Oneworld flights, in arguably the best business class in the system. The Qatar Airways flight from DOH to LAX currently flies a 777-200LR, which when it comes down to it, is a big flying fuel tank with some seats put in. When you see it at the gate, you do a double take wondering if it’s really going to make it all the way. It’s shorter than the now ubiquitous 777-300s and a350s, and clearly smaller than the a380s lurking around the Hammad gates. It looks like a 787-800 that forgot its stylish wingtips. However, that -LR moniker is no joke. The “Long Range” version is currently flying the epic 18 hour haul direct from Doha to Auckland as well. Respect the product. I had originally planned to fly back on the second half of my original bargain-basement positioning ticket that I’d started the first weekend of this back in March. However, I’d been keeping my eyes open for an alternative as it was an AA coded flight on BA metal, meaning there was no way out of seat 70J, and it wouldn’t be earning many miles anyway. A few weeks before I was set to do the last visit to Copenhagen, I was having a look through award tickets on the British Airways website and saw one Business class seat on the Doha-LAX flight. Now, they of course wanted an insane amount of Avios for the flight since BA has a distance based award chart. The thing to know is that this meant that American could also ticket this based on their own chart, which comes off much better for this flight. I called AA and grabbed the seat for 70k AA miles, which is plenty, but a pretty good use of miles considering that this is a roughly $5,000 flight if you were to buy it outright. A few Avios got me an economy seat down to Doha from Copenhagen, and I was good to go. Plan B has never looked better! Doha Hammad Airport is truly one of the city’s greatest assets. It’s modern, large, and luxurious. Even its scale, however, doesn’t entirely do away with the ‘morning rush’ feel that happens between 7 and 9 am when all of the eastbound flights are scheduled. Thankfully, even the lounges have large capacity and an open feel, which helps to absorb some of the crowds. Qatar operates two lounges which are accessed based on class of travel. If you’re looking for lounges access based on Oneworld status, you’ll be sent to a separate “1st” or “Business Class” lounge, which are not dearly as large or well appointed. Breakfast at the Business Class lounge. Ful Mandames and Congee. Have both. Since I was booked into Business Class, I had access to the Al Majoran Business Lounge, which is centrally located up an escalator by the exit of transfer security and nearby duty free. First Class passengers are directed to the Al Safwa lounge, which is separate and truly beautiful. The Business class lounge is huge, and covers two floors and several different seating and dining areas. There are also nap spaces, and showers. The breakfast buffet is a satisfying mix of flavors, including eggs, potatoes, ful mandames, and congee. The bar serves a great cup of black tea, as well as mimosas and the like. There’s also self serve coffee and pastires. You won’t go hungry before your flight, and definitely not during it. Qatar is in the process of updating their fleet to the new “Q-Suites” business class cabin. However, the LAX flight hasn’t been done yet, so the seat map is 6 across in a 2-2-2 configuration. What the seats lack in privacy, they make up for in space. The foot room between each row is ridiculous, and the seat width gives you plenty of room to sleep. When you board you’ll find a mattress pad, large comforter and pillow, and a BRICS amenity kit waiting for you. As a side-note, I love the brand of amenities they’re currently providing, and they’re expensive to buy stateside, so keep ‘em. After boarding, they pass out the new White Company pajamas and slippers. The service starts when you board, with a choice of drink and hot or cold towel. You can order anything, but most of the cabin goes with brut or rose champagne. Both good choices. The entire menu and service is “dine on demand,” so you can design your own plan for the flight. Many of the flights to the US, including this one, depart in the morning, so there’s a full breakfast menu as well as light meals and main courses for later. As is my rule, I started with the Arabic breakfast, which is of course ful mandames, with feta and vegetables for sides. What really needs to be said for the meal service, along with the food, is the attention to place setting. For being on an airplane, it really is over the top. Every meal, no matter hat you order starts with a warm bread basket, and a full place setting complete with ‘candle’ for ambiance. It’s restaurant quality, down to the fresh pepper grinder and Himalayan pink salt. Breakfast was delicious and satisfying. I fully recommend it. A bit later in the flight I tried the smoked fish, which was good, but not my new favorite. I added in the soup and a salad as well to make it a complete meal. For some reason, Qatar’s soups always hit the spot. Another classy addition to the service on these flights is the cocktail menu. I mainly stuck to the champagne and wine, but I did have the obligatory cocktail to show my appreciation. Nearly all of the options were available throughout the full 17 hour flight. On Qatar, it’s custom to ring the call button for service, and the flight attendants are uniformly pleasant and accommodating. The only downside is it will ruin you for many other airlines. Each seat has a large TV screen, which is touch sensitive, though you’ll need to use the remote since there’s too much space between the seat and the screen to reach forward to control it. On the current 772 planes the resolution and responsiveness is on the dated side, but it doesn’t take away much from the functionality. The catalogue has a reasonable amount of options, including new release movies. I usually watch TV on planes, but due to their splitting the options between US/UK shows and international programming, I ran out after a weekend of going through the same selection. I switched over to movies, and it wasn’t half bad. Between sleeping, watching, and eating, I wasn’t bored. We arrived about 10 minutes late into LAX’s Tom Bradley International Terminal due to a wind shift, and a rare over-water approach pattern. Our gate was ready, and using Global Entry I was through to baggage claim in a matter of minutes. Even better, Qatar was on point and delivered bags tagged for business class first. Mine was one of the first three on the belt, and had me to the curb just a few minutes later. No complaints at all. Overall, Qatar lives up to all expectations. I’m sure their new Q-Suites are a more modern take on business class, but their standard configuration with the excellent soft product they provide makes any flight with them fantastic. I have flown in business class with them across their cabin floor plans and planes, and have never had a flight I wouldn’t happily take again. Given that they do actually open up some inventory for Oneworld partner bookings, this makes them one of the best redemption options in the alliance, and a huge asset. I can’t wait for my next flight through Doha. Luckily, I won’t have to wait long! As always, travel well, and enjoy the journey. “Reflecting Swan” On the Copenhagen canals in winter. Sadly, this weekend is the last of my planned mileage runs to Copenhagen and back. It's been fun to get to mileage run to a place I honestly love spending time. I should also mention that this deal is still available on some dates through the end of the year, and into next year. Prices have gone up, but they’re still technically a 'good deal.’ I tried for awhile to keep my back to back runs going by getting another ticket for my return this weekend, going back to Copenhagen or Oslo... or any of the Nordics in the early months of next year, but for my exact dates the availability just didn't turn out. “The Wave” - Street art of sound and light, Ofelia Plads, Copenhagen. Even though there was a fair amount of premium economy and actual economy on these trips, I've definitely enjoyed them. They earn well, are efficient with time, and I've gotten to spend some nights in one of my favorite cities. As far as airports go, there's been many trips to the Qantas and Flagship lounges at LAX, the mixed bag that is Heathrow (good lounges, bad rest of life), and the Copenhagen airport is cute and low-stress with a cheap and easy metro line that goes right to the center of town. One drawback to this city is that Copenhagen's hotel situation is a tough one if you're a follower of the major US brands. Starwood/Marriott is limited to the "Sky Bella" near the airport, or the Downtown Marriott. The former is out of the center of town, and the latter tends to be pricey. If by some chance you're with Club Carlson, you're the best off of the US chains as there's a couple Radisson Blu options that are well placed. Pricey still, however. This, and my love of the city and culture, led me to take a 180 and start booking a range of Airbnb options for these runs. It's been.... an experience, but by all accounts successful. Traveling alone, I've a couple times booked a private room, instead of an entire place which saved me significantly. Think $60 instead of $260 for a hotel for the same night. It has some upside, as well as the price, if you're in the mood- depending on the host, you can learn a lot about the neighborhood, restaurants, parks, and pretty much anything else. However, if you're not feeling social, this can be a drawback as well. What's also fun is to get to experience staying in parts of town outside of hotel districts, and in architecturally interesting spaces. Think a Christianshavn canal street, or the well kept streets and parks of Frederiksberg. My stay in Frederiksberg. Minimalist Scandi furnishings, lots of light, and oiled pine floors with just the right amount of creek to feel cozy. On these trips I've spent a fair amount of time visiting old favorites, but I've also stumbled on a few new ones. I like to try out some local places, and to me mileage runs aren't the time to go all out on the exclusive and expensive. It's all about last minute impulses that make memories. Nordic Noodle (Norrebro + other locations) I was wandering around on my May trip from Frederiksbrg to Centrum trying to find a rentable Donkey Republic bike, and stopped in for lunch. It’s a fun build-your-own noodle place, with all kinds of fresh ingredients and different styles. Reasonably priced too! Torvelhallerne (Norreport) Right by the Norreport train station, this is a great stop for shopping, eating, and taking in the city. Part open-concept food court, part farmers’ market. A perfect place to stand in a (reasonable length) line for traditional smorrebrod - open-faced sandwiches that can be piled up to 4-5 inches high with all kids of ingredients that somehow work together. You have to have it at least once per visit. No Stress Bar (Centrum/Indre By) As with just about everything new on these trips, I stopped in here on impulse, just because I liked the name. I was expecting (I don’t know why) more of a restaurant/bar, but what I found was a truly fantastic cocktail bar with great service and high-end mixology. The ownership is Norwegian, and the staff genuinely love their craft. Let them suggest a new favorite for you. Fredericksberg Gardens (Frederiksberg) Easily accessible by bike from pretty well anywhere in the city, this large park is a great place to go on a nice day. There’s much more space and nature than in the central ‘Kings Garden,’ but a warm afternoon will fill it up with locals relaxing on the greens, and taking boat rides around the lakes and canals. Grab a cider and enjoy! Christiansborg Palace & Parliament Buildings (Centrum) If you’re roaming around Copenhagen even for a day, you’re likely to pass by or through Christiansborg. The complex houses the major branches of government, as well as many historic sites and exhibits from Denmark’s history. Just walking around is worth a few minutes, but you can also pay to tour various buildings, or if parliament is in session, sign up to view their process. So far, I haven’t managed to get my timing right for this, but maybe someday. What I did manage to tour on my March trip, was the royal stables. The Danes are famous for their horses worldwide, and there’s a long history of breeding and training in the country’s history. The stables is located right on the Christiansborg grounds, and house the impressive matched white horses still used for many royal and other public displays and events. There is also a truly impressive display of harness and carriages, some of which are still used. It doesn’t take long, but only runs US $5, or is free with a Copenhagen card pass. What do I want to see this weekend? Who knows... I'm trying out staying in an Airbnb in Vesterbro. I've been through this area on other trips, and had dinner at Madklubben in the neighborhood in March. It's well located near the lakes, central station, and downtown, and has a younger, hipster vibe. I'm sure I'll come across a few new places. I only have one night, and about 1.5 days this time around though. A few weeks ago, while obsessing over my non-upgradable economy fare for the return, I ran my dates against available awards and was shocked to see a business class award via Doha on Qatar in the British Airways system!! It would have been more Avios than I wanted to spend, but I managed some workarounds and booked part in economy down to Doha, and then the ultra longhaul with AA miles allllll the way back to LAX. This means 16 hours in some of the best business class Oneworld has to offer. Yes, please, and thank you. Sounds like an excellent way to end these trips! I hope they keep running these fare sales. They're not only a great deal, and earn a good haul of miles, but now that I've been to Copenhagen 5 times, in every season, I still want to see more of this part of the world. Maybe I’ll be able to find my way back here, or maybe Oslo, or back to Stockholm. I'll go where the fares take me! What do I think about British Airways Premium Economy (branded as World Traveller Plus)? Premium economy, I will say is better than regular economy. The seat is closer to domestic first/business plus a little more recline and a footrest, which I have currently augmented with my Briggs & Riley cabin bag to create a bit more support. This is my first flight on British Airways' a380 World Traveller Plus, and it's going fine. I have a nice bulkhead seat in the front row of the cabin, which is on the upper deck behind Club World. The only seat in the cabin I'm coveting is the one next to me- 61A, which is the same as 61B, but has control of two impressively large storage compartments by the window. They won’t fit a cabin bag or larger backpack, but small bags, headphone cases, blankets and pillows all fit nicely. The bulkhead rows, which are 61 and 60 on the a388 really are the best in the cabin, with the last rows being the worst as they are right next to the busy lavatory and galley area. I can’t imaging getting much rest or work done there while being constantly bumped and hovered next to. These rows may have some seats blocked until the day of the flight, as they’re accessible and/or bassinet seats. It’s worth asking at check in if one has been freed up. Since this flight departs out of LAX’s Tom Bradley International Terminal (“TBIT”), I checked in with the BA counters rather than the Flagship or Priority check in at the American terminals. The line at my time of day was minimal, especially since I could use the First Class lane as a Oneworld Emerald. I asked how booked the flight was since it’s a known practice to upgrade top tier flyers in the case of an oversell in economy. However, the agent let me know that wouldn’t be the case this time. As it turned out the flight was fairly full, but not oversold. All seats in the World Traveller Plus cabin were filled. Though it wasn’t the case at the time of this flight, British Airways has now joined PreCheck at LAX! So if you’re eligible, this is now accessible to you when flying with BA. Given that TBIT’s security can have some long lines, this is good news. More time for the excellent Oneworld lounge options that seem to just be getting better at LAX! Since it’s a big plane on an international route, this flight boards about an hour ahead of the departure time. Whether you need to be there this early is a judgment call based on what bin space you need, and how much longer you want to sit on the plane. Since I wanted to check out the cabin before most people got onboard, I went ahead and boarded with group 1 due to status. At this gate, the boarding process is completely automated using “biometric self-boarding.” You don’t need to have a ticket, a passport, or even see an agent. You just step up to the boarding kiosk/gate, the computer images your face and checks it against your digital passport info, and lets you board. It was my first time using the technology. I’m not sure how much time it saved since it appeared most people weren’t familiar with it yet, but I suppose it saves BA on labor costs. That done, I headed to the upper deck of the plane to get settled in. Bin space, even later on, was fine. The cabin is laid out in a 2-3-2 configuration, so unless you're planning on cuddling with your travel companion, the center seats are to be avoided. The seat also comes with a blanket, small amenity kit, and a likewise small pillow. If you like anything extra to get comfortable, you’ll need to bring it with you. We pushed back on time, without much of a runway delay, even though LAX is know for them lately. On thing that’s always fun about flying the a388 is how uneventful takeoff feels. The equipment is just so massive that not much seems to translate through to the passengers inside. Once in flight, it handles turbulence well, making for as smooth of a journey as is generally possible across the Atlantic. Before takeoff they offered a pre-departure beverage to the WT+ cabin, which was a choice of water or orange juice. This was a nice touch I wasn’t entirely expecting. Once in flight, the real service started with hot towels and menus, followed by a first pass with the drink cart and a bag of pretzels. This was also when they took meal orders. As a side note, if you’re departing from Heathrow or Gatwick, you can pre-order a meal in WT+. FA: would you like wine with your dinner? FA: Pinot or Sav blanc? The Flight Attendant then proceeded to hand EVERYTHING over at once. Please note the dinner service is a fair bit off. So I'm left with a tray table packed with wine, water, tonic, two bottles of gin, and pretzels to boot. Not classy, and honestly awkward. On to dinner, and they serve front to back so I ordered the beef. It's fine. It was along the lines of AA domestic 1st, which doesn't say much, but I had the beef cheeks and pork chop at the Qantas lounge, so I wasn’t terribly hungry anyway. It should be noted that at this point any comparison between WT+ and higher classes of service ends. There's really no follow up service at all. If you want anything else- refills, snacks, etc., you’re forced to wade back through main cabin proper to ask. This also subjects you to any perceived side-eye for asking. Before landing they served a breakfast. It wasn't good, but I ate it. I needed to fortify myself before being dumped headlong into the LHR chaos at what was about 1am my time. In the bulkhead seats, the IFE screen folds out from the armrest, while in the rest of the cabin, it’s located in the seat back in front of you. There’s really no other place to put it as the actual bulkhead is fairly far away (which means unlimited legroom). It does make getting up and down slightly awkward, especially if you have food or drinks balanced on the tray table as well, but it’s worth it. There are a reasonable selection of movies and TV on the system, enough to get you to sleep or to Heathrow, whichever comes first. The touch screen and remote are decently responsive, but all in all it doesn’t look super modern. This is likely because it’s not, and BA is slowly rolling out a newer WT+ product, which hasn’t been installed on the a388 as of yet. I settled in after the meal and watched some old favorites from the TV selections before taking a nap. Though the WT+ product was passable for this flight at a highly discounted rate, sadly, BA is a study in how the mighty have fallen. Historically, it was a truly good airline with better products and service, but budget cuts have lowered their standard to the point that most competitors hard and soft product is much better. AA, CX, QF, etc all have slightly-to-much better Premium Economy on similar routes, and BA's Club World (Business class) seat likewise pales in comparison. In the end we pulled up to the gate 15 minutes early, and I was happy to be on my way. All in all, it was fine, especially since I was flying on a cheap fare. The bulkhead seat is decently comfortable with plenty of leg room, but I wouldn't want to be really anywhere else in the cabin. In any case, I'm getting to Denmark safely and on time, which is the goal in the end! I don't think I quite had realized until recently, though I well should have, that this weekend's mileage run would conclude with my crossing my Million Mile threshold. Today as I fly over the Nevada desert on the way back from London, someplace over Las Vegas, I will have completed a million- yes a million - miles on American airlines and its partners. It's been over a decade of many, many, journeys in the making. This million has touched on every continent Oneworld flies to, and over 20 countries and counting. As a practical matter, crossing your millionth mile in the AAdvantage program comes with some modest and lasting benefits along with the bragging rights. For starters, they toss an extra 35,000 miles into your account. It's not a million, but with miles ever harder to earn on low fares, I'll take it. It also comes with Gold Elite status for life. Sure, Gold benefits are minor, but it's the thought that counts I suppose. "Elite for life" sounds nice, doesn't it? Practicalities aside, milestones are times to look back and see what you've learned and also wonder where to go from here. I am not being cliché when I say that these million miles have been life changing. I appreciate both the expansive experience of the world, and its smallness and vulnerability. Our entire planet, our entire home can be circumnavigated on a 777-300 in a long weekend, and that includes time to get out of the airport and have some Dim Sum. I feel like it calls for some kind of celebration, I'm not entirely sure what's appropriate. Once again, alone in a crowd and on the way from somewhere to somewhere else entirely. Maybe this is exactly appropriate after all. As I wing over Vegas, few 'thank yous' are probably in order. As much as I've dedicated words and pages to complaining about the changing AAdvantage program, I'll be the first to also acknowledge that it's this program that has shown me the world, and let me share it with my family. Speaking of family, I'm eternally grateful for Mrs. CruisingAltitude for indulging this bizarre compulsion with only the slightest amount of side-eye when I explain my plan to start a mileage run in Sri Lanka, as if that's a perfectly normal human thing to do. I also am eternally in debt to the crazy friends I've met along the way who are also plagued by this curious affliction. These are the friends who when I ask who's up for flying to Copenhagen, or Kuala Lumpur, just to fly home again, are always game. Flying around the world for the hell of it is fun, but doing it with a bunch of other crazy flyers is amazing. They're the ones I've flown with to Africa to pet lions, toasted life with at the world's tallest bar, and stood with watching the sun come up over the Persian Gulf from hotel balconies, all just for the sake of the journey. As for where to go from here? Anywhere, I suppose. The next level is two million. Maybe next decade..... but who really knows. As always, fly safe, travel well, and live for the journey. Welcome to Altitude’s new site, and thank you for taking the time to have a look around. By popular demand, we’re now making our wealth of knowledge of the airline, hotel, and loyalty industry available to you. Travel should be inspirational and elegant for everyone. Watch this space for regular entries and features on travel and lifestyle.